Easy Chicken Garlic Wings - Let the Baking Begin! These Easy Chicken Garlic Wings are roasted in the oven until crispy, then drenched in sweet and sour garlic sauce combined with some BBQ sauce. This makes for a fantastic combination that wins every time! We like the Chicken Wings very crispy, so adjust the baking time accordingly if you like them less so. 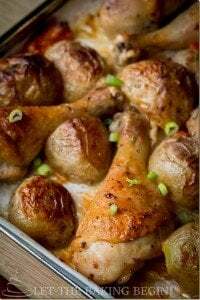 Garlic Ranch Baked Chicken Thighs – The best chicken thighs recipe. 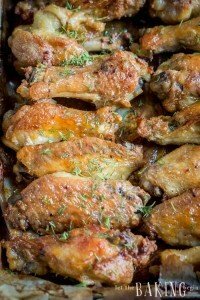 Garlic Ranch Chicken Wings – Baked wings with a garlic ranch flavor. 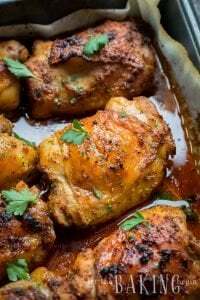 Paprika Baked Chicken Thighs – Easy bone-in chicken thighs. Turn the oven to 500F. Line a baking sheet with foil, set aside. Wash, and pat dry the chicken with paper towel. Place in a large bowl, sprinkle the seasoning and pour the sauce over the chicken. With your hands thoroughly mix everything together until chicken wings are evenly coated in the sauce and seasoning. Distribute the wings evenly on the baking sheet. Place in the oven. After 15 minutes, turn the oven down to 375F and bake for another 45 minutes. 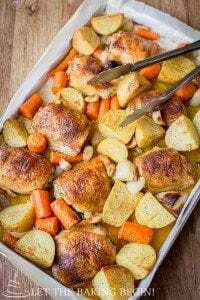 When the chicken is browned on top, turn each piece browned side down and bake for about 20 minutes or until the other side is also brown. Once the wings are soft and roasted through, take them out of the oven, transfer them to a bowl, pour about ½ cup your favorite sauce (Sweet Garlic Sauce, BBQ, Sweet & Sour Sauce), shake the bowl to evenly coat and transfer to a serving plate. Serve with hot sauce or any sauce of choice. 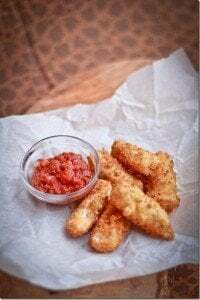 Hello, was wondering if I wanted to make these boneless would chicken breast still taste as good? Great recipe!! Chicken breast is a whole different kind of meat so it requires a little bit different kind of cooking. The marinate and the sauces would still work for the chicken breast, but you definitely do not want to cook it longer than 20 minutes at 375F.